Our single point sonic flare tips provide an exceptionally flexible means of high pressure gas disposal whether by venting or flaring. Each tip is purpose designed for each different application and takes into account the need for relatively low radiation, reliable ignition, long life and elimination of problems caused by high winds. This type of flare is the most basic sonic tip, typically operating at pressures up to 6.0 barg. They provide the operators with a simple, robust and reliable flare tip that will typically exhibit long life time and are relatively easy to manufacture. Argo Flare Services can supply new bespoke sonic flare tips or refurbishments of other OEM flares to suit the operator’s specific platform or site conditions. 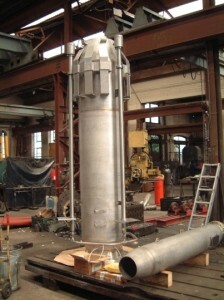 Where there is also a low pressure flare tip this can be incorporated within the sonic pipe flare or close coupled to it. The standard flare tip is fabricated in heat resistant 316L SS, 310S stainless steel or 800H materials. Upgrades to higher heat resistant materials are also available when the operating conditions are more onerous than normal. The main body consists of a single pipe, wind deflectors, and flame stabilisers. A sonic discharge nozzle is fitted to the HP body. The nozzle provides reliable stabilisation of the flame at all flows and also ensures efficient operation, reliable flame ignition and elimination of flame lift at high gas discharge velocities and high winds. A combination of gas bleed holes and flame stabilisation lugs enables some of the gas to escape the jet nozzle and be ignited by the pilots. This effectively multiplies the pilot heating power considerably and greatly contributes to flame stability across all operating and atmospheric conditions. In certain circumstances small diameter flame stabilisation pipes will be added to the flare body to enhance flame stability.